Oooooh my first baking-related post of the year! I say that, but this recipe requires zero baking whatsoever, so it's ideal for people that don't fancy switching the oven on. Before I get into this post though, I just want to say that the lighting in my grandad's house is not ideal for taking photos. I've tried my absolute best to neutralise the warmth in these pictures, so if they're coming up very yellow on your screen, then I'm reeeeally sorry! A girl can only play with the temperature so much! But yes, as you've seen by the title, this is a cheesecake recipe, which is something that I don't think I've done on here before. I've made cheesecake brownies, but never a sole cheesecake, which is odd because it's actually one of my favourite things to make! Now, this might be a little bit controversial, but I'm a huge advocate for fridge cheesecake instead of the baked New York style. I just find baked cheesecake to be dry and kind of unpleasant to eat, whereas as fridge cheesecake is cold with a gorgeous crunch to the base and a super smooth topping. Plus, you require less ingredients to make them, so they're also a cheaper option if you're in the mood to make a little something! I made this guy for New Year's Day. We have a bit of a tradition in our family that we spend NYD at my grandad's house and have a buffet-style spread where everyone brings a little something, but this year, I was informed that that wasn't happening and we were getting a Chinese instead. By that point, I'd already bought the things to make a cheesecake and some sausage rolls (which I also ended up making and we ate them on a walk to the park), so I went ahead and made it anyway! If you can't eat a Chinese takeaway followed by a naughty slice of cheesecake on NYD, then when can you? So as you've seen, this is a white chocolate and lemon cheesecake - two flavours that I feel really complement each other. You get the smooth creaminess of the white chocolate with just a little bite of lemon. 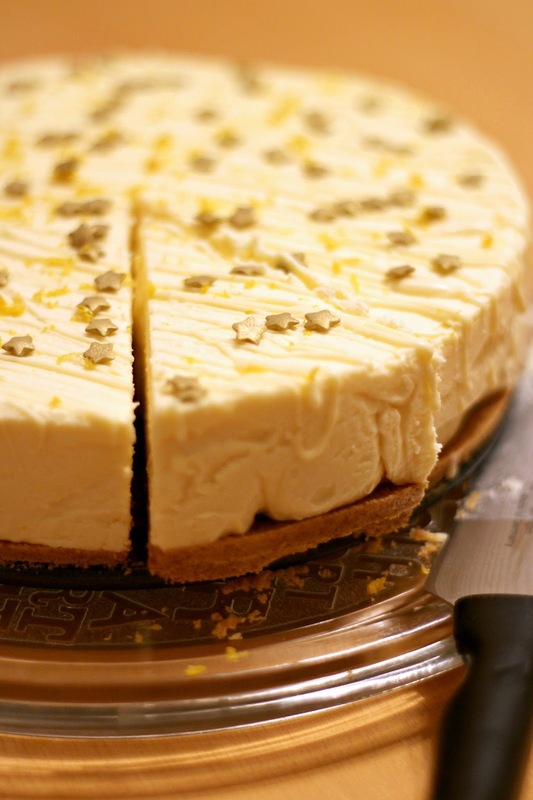 Of course, the white chocolate is totally optional and this could be made into just a normal lemon cheesecake, but I find that adding chocolate into the mixture helps the whole thing to set better. It helps the cheesecake to keep a bit of structure, but doesn't go so solid that you can't get a knife through it. In fact, this is super easy to slice up. A knife just glides through it, so have no fear about adding chocolate! Crush your digestive biscuits in a food processor until ground into crumbs. You may need to stop the food processor to push any unbroken bits to the bottom. Melt your butter in the microwave, making sure to stir it every 10 seconds or so to prevent burning, then pour this into the food processor and whizz until the mixture becomes crumbly. Tip this biscuit mixture into your loose-bottomed tin (I used a 20cm tin which resulted in a base with medium thickness). Use the back of a tablespoon to smooth and press the crumbs down until they're in a flat, even layer. Pop this into the fridge for 30 minutes to set. Break your white chocolate into a heatproof bowl and melt it over a pan of barely simmering water. You can also melt it in the microwave, just be sure to check and stir it every 20 seconds or so to prevent burning. Once melted, allow your chocolate to cool slightly. Whilst the chocolate is cooling, mix together the cream cheese and mascarpone in a large bowl with a hand mixer. They should become smooth and creamy. Add in the double cream, lemon zest and juice, and beat again with the hand mixer until the mixture becomes slightly thicker. Pour in your cooled white chocolate and beat again. At this point, the mixture may start to look slightly curdled, but trust me, continue to mix and it will sort itself out. Pour or spoon this mixture over the set biscuit base, and spread it out with a spatula, making sure that the top is nice and even. Pop this back into the fridge for 4 hours or overnight to set. When ready to serve, melt your remaining white chocolate and drizzle it over the top. Sprinkle on your lemon zest and star sprinkles to finish it off. It's such an easy peasy recipe that it's virtually impossible to go wrong! It's absolutely delicious served up with double cream and a handful of raspberries, so it'd be perfect in the summer. 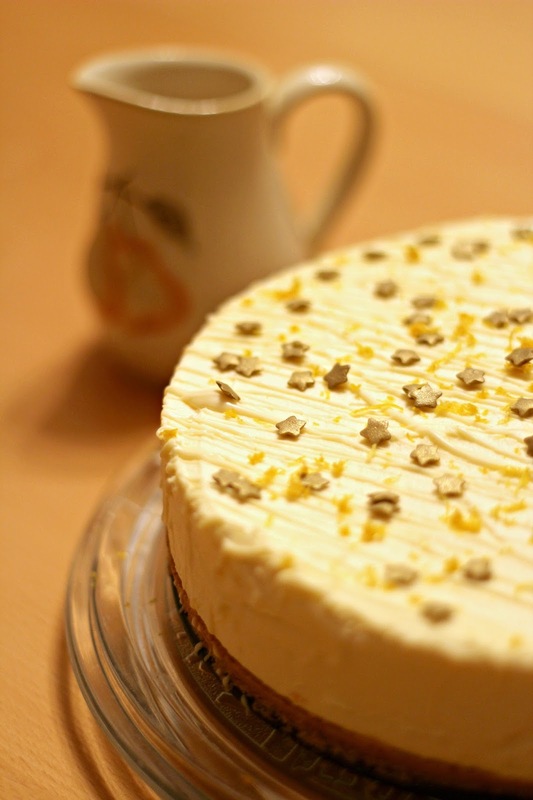 I'd love to make more cheesecakes this year, so keep your eyes peeled for any future attempts! Oh my god this looks amaaaazing! 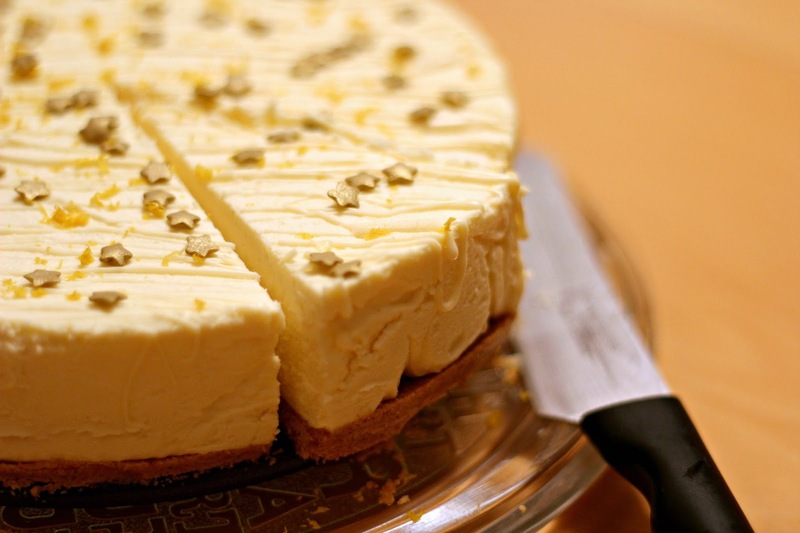 I'm with you in that I way prefer fridge cheesecake - so much easier to make!